William P. Hobby Airport is the second largest in Houston and 37th busiest in North America. William P. Hobby Airport is one of three airports serving Houston in Texas, US. The airport provides easy and fast passenger access from the parking lot into the terminal. William P. Hobby Airport has a central concourse with 25 gates. The airport's old terminal building was converted into a museum. William P. Hobby Airport has four runways. William P. Hobby Airport is one of three airports serving Houston, Texas, in the US. It plays a key role in providing air connectivity for passengers travelling through the region. The airport is owned and operated by Houston Airport System. Named after a former Texas Governor, the airport is the second largest in Houston and 37th busiest in North America. In 2011, 9.8 million passengers visited William P. Hobby and 63,617 aircraft movements were recorded during the same period. Hobby Airport serves as one of the south-west hubs for many airline operators and is planned to be made an international gateway by 2015. It contributes $4.4bn towards the region’s economy and employs close to 51,000 people. "Named after a former Texas Governor, the airport is the second largest in Houston and 37th busiest in North America." The existing passenger terminal was opened to international traffic in 1955, while the airport has been used for general aviation purposes since June 1969. In the 1970s, various regional airlines initiated travel services from the airport. Rapidly increasing regional traffic has endowed the airport with the status as an important regional hub of North America. The T-shaped terminal building of the William P Hobby Airport has a two-level central concourse with 26 gates. A terminal renovation programme was included in the master plan formulated in May 2004, which included the plan for concourses B and C to be replaced with a new central concourse, and concourse A to be replaced by a new east concourse. The $77m central concourse was completed in July 2007, while concourses A and C were demolished. Plans for the new east concourse, however, were shelved. Instead, the number of gates in the central concourse was increased to 25. The terminal offers Wi-Fi internet access and has a number of amenities, such as cafes, bars and restaurants, shops and visitor information centres. Designated smoking areas are located near the terminal entrance. George Bush Intercontinental Airport is a central part of the air facilities of Houston, Texas, USA. The Houston Airport System has three facilities: George Bush Intercontinental Airport (GBIA), William P Hobby Airport and Ellington Field. Six new X-ray screening machines were issued to Hobby Airport by the Transportation Security Administration (TSA) in May 2010. These are equipped with advanced imaging technology and can detect weapons and illegal items. A $250m expansion project commenced in June 2006, developing the ticketing lobby space, improving the traffic flow from terminal entrance to the security check point, upgrading the gates for handling passengers flow and flight operations efficiently, and adding three signature art works to the airport. It was completed and inaugurated in August 2010. A new $350m renovation project to enhance the facilities of the airport is currently being implemented, which includes a $6m capital improvement programme for ticket-level entrance ramp. It started in October 2011 and is expected to be completed by mid-2012. A new baggage claim area was also part of the renovation project, which includes new terrazzo flooring, longer baggage conveyors, and upgraded lighting and restroom facilities. Its construction started in June 2010 and inauguration took place in June 2012. William P Hobby airport has four runways designated 4/22, 12L/30R, 12R/30L and 17/35, all of which are equipped with highly advanced navigational aids and lighting systems. "Rapidly increasing regional traffic has endowed the airport with the status as an important regional hub of North America." Runway 4/22 is 2,317m long, built of concrete and equipped with ILS (Instrument Landing System) III. Runway 12R/30L is asphalt covered, 2,317m long and equipped with ILS category I system. The two serve as the main runways for the airport. 1,569m-long runway, 12L/30R, is built of concrete, while runway 17/35 is 1,829m long and built of both asphalt and concrete. Both runways are used for general aviation. The airport has more than 4,000 parking spaces, including a four-storey public parking garage and two economy parking lots. 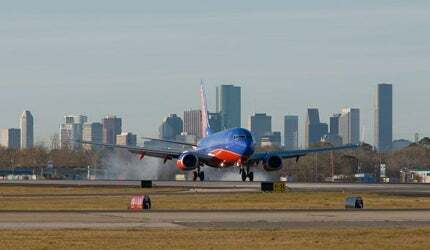 Southwest Airlines has submitted a proposal to the City of Houston for the expansion of the Federal Inspection Services (FIS) facility at the airport, which will enable the airport to provide international services. The city council approved the proposal in May 2012 and international services are expected to commence in 2015.